The problem of estimating underlying trends in time series data arises in a variety of disciplines. 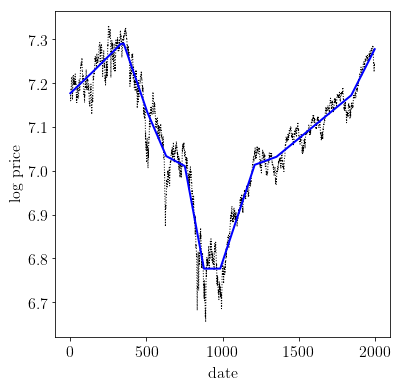 The \(\ell_1\) trend filtering method produces trend estimates \(x\) that are piecewise linear from the time series \(y\). CVXPY is not optimized for the \(\ell_1\) trend filtering problem. For large problems, use l1_tf (http://www.stanford.edu/~boyd/l1_tf/). # Load time series data: S&P 500 price log. # Form second difference matrix. # Solve l1 trend filtering problem. # the iteration limit. Use CVXOPT instead. # Show plots inline in ipython. # Plot estimated trend with original signal.